I have come to realize that there is much more material in the Mk. VIII limb irons than there needs to be. The cross-hatched portions, in the photo below, will be omitted on the new Mk. IX limbs. It is hoped that this reduction in the weight of the limbs will boost velocities into the 350+ fps range (from our current 300 fps) with a 7,000 grain bolt or glans, all while still using our customary 33 1/2″ draw length. Keeping in mind that Firefly has 63 inches of draw length available in her current format, there is plenty of room to experiment so long as we are able to keep the overall draw weight within a range suitable for her framework. 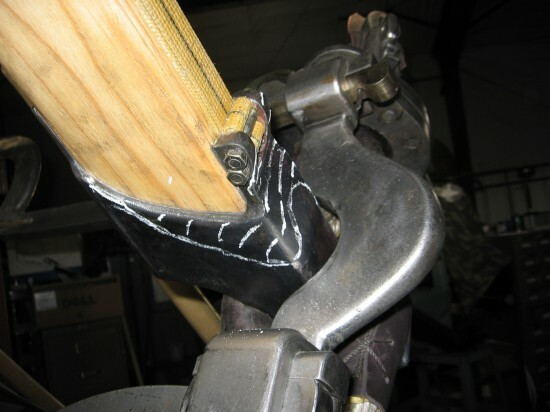 Part of the reason we have taken up glans testing again, other than as a counter to Campbell’s dismissal of Dr. Rihll’s theories re: ballista launched glandes, is that bolt manufacture is a costly endeavour, especially when it is used in the tune-up stage after new limbs are installed. Shooting lead glans will allow us to try a variety of projectile weights and torsion settings for the bundles, with minimum expense. 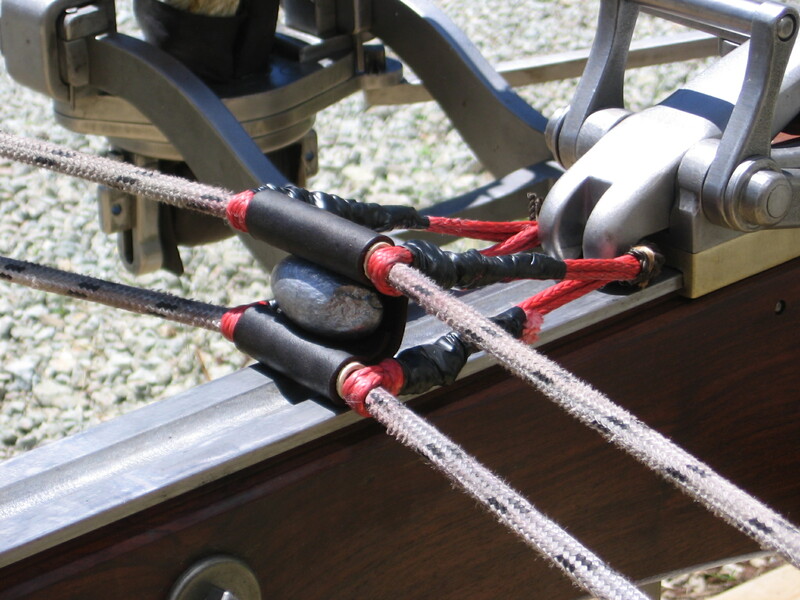 It is most disheartening to be continually breaking Dura style bolts when they are fired out of a powerful ballista. Even when shot into a soft sand backstop, they very often yaw or twist as they penetrate, and then snap goes the shaft. Our experiments indicate that effective glans projection from normally bolt shooting torsion engines, is a relatively easy feat to master, requiring nothing more complicated than a properly designed slingstring. While Mr. Campbell’s point by point refutation of Dr. Rihll’s arguments for the use of glandes in ancient torsion engines may make sense to some, this experimenter finds his arguments somewhat hollow in the face of the significant success we have had shooting glandes on our test range. In the military, effective dual use is usually a big plus. It is hard to imagine how the Ancient Greeks and Romans would not have developed all possible avenues when it came to the ammo their torsion engines were capable of shooting. I see no evidence that their imaginations were limited to a set of ancient texts when it came to weapons development. It takes more than just forever fussing over some incomplete writings to understand what these machines were capable of. Of “rushing air” and invisible passage. In this next video we can hear, rather than see, a 381 gram lead glans beating its way downrange at 277 feet per second. Range is 55 yards. If you turn up the volume and look at this video on a big screen, in a darkened room, you can gain a sense of how these projectiles must have appeared to their recipients. Just visible is a glint of lead in the left of the doorway, followed by a streak of grey to the left of center screen, and then a small splash of dirt on the lower left as the glans grazes the top of the backstop. The knocks you can here after that are from the glans crashing into the tree line 40 yards further on. Groove on that beat Daddy-oh! Those secondary impacts sound jazzy. Sufficient unto the day is the snivelling thereof. A glans funk is the worst kind of funk to be in if you are a catapult maker. Slow velocities in the mid to low 200’s (fps) does nothing to lighten the mood. True, these were some extra light pills we were tossing out there, but you’d think that would make them faster, if anything. It started out with a 55 gram speck of steel bar rocketing along at (sarcasm alert) 242 feet per second (fps), for a yawning 110 foot pounds of energy (fpe). Just knowing the bark on this tree was all wrong, I bit back my skepticism. However, I remained true to our methodology by making only an incremental increase in the mass of the projectile for the next shot. With this, a 133 gram slug made it up to 354 fps, for a titilating 571 fpe. After this a duo of 155 gram steel slugs dawdled on the chrono readout for an average speed of 225 fps. WTF! How did that make many sense? Was this going to get really depressing, really fast? As it turned out these last two shots were an anomaly, and things were going to get really interesting, really fast! …..
Next a 270 gram piece of 1 1/4″ dia. X 1.44″ long steel bar hit 284 fps, energy 746 fpe. Yum! at this rate we were getting into the upper echelon of what the best Balearic hand slingers could do. 813 foot pounds (3.62 kilo Newtons) was achieved by, the very athletic, Mr. Luis Pons Livermore. He is a native of the Balearic Islands and is a recent world champion hand slinger. This data on his slinging prowess was taken from his appearance in an episode titled, Lost Science of the Bible on a show called, Ancient Discoveries. (Yes Egor! I know! It’s “Ancient Discoveries”. Now, do piss-off!, there’s a good chap. ……Sorry about that….. Egor can be such a snob sometimes.) Anyway, a quick Google can get you the whole story of this modern day David. He is a Cool Dude. It seems that part of the trend in this string of shots from Firefly is for the velocity to increase as the weight of the projectile goes up. While this pattern may be enough to make high school physics teachers wince, that is what the measurements indicate. Yes, I know! this doesn’t make any sense. Raise the payload weight, while keeping all the other factors the same, and the velocity should go down. Tell that to Firefly. Right now, she’s grinning all the way to the bank. The above velocities were carefully measured with a doppler chronograpth. This device has been giving us highly consistent and accurate readings ever since it was installed on a longer bayonet mount. I check its accuracy by using a match grade, spring piston air rifle and comparing test shots between it and two other chronograpths. I am confident that all my readings with it are accurate. Feeling a sense of renewed optimism, I decided to boost the projectile weight back to our old standby from two years ago: a 400 gram lead glans. Actually the one we used in this test weighed 398 grams. At the moment of firing the sound of the machine had a lower tone to it than in the previous shots. And the flight of that 398 gram glans….you should have seen it! Dead center over the groove, no sideways drift at all out to the 100 yard tree line. I observed that it was not tumbling, but moving through the air sideways, just as it had been when ejected from the pouch. Hurrah! ….. Yipee-kay-yeh! ….. multiple Hosannas, etc. This worthy 398 gram lead glans had put us into the zone we were at two years ago, clocking in at 290 fps, with an energy of 1,146 fpe. We’re back baby! The reprising was over. …..As the imaginary applause dies down, a moment of somber reflection ensues….. Even granting the prodigious surge of talent that might arise in an ancient, Golden Age of handslinging, Firefly was clearly exceeding the upper limits of what a human athlete could achieve. No surprise there. She is a big and heavy machine. A handsling is not much more sophisticated than the belt I use to hold up my trousers. All kudos to such a simple and effective device. But in this discussion, that is hardly the point. We are speaking strictly about the absolutes of power generation, not the perceived efficiency thereof. And so, if a handslinger of Mr. Livermore’s caliber, can generate 813 foot pounds of energy, it seems fair to say that, even granting the ambient conditions of an adrenaline fueled martial moment, the rank and file ancient handslingers were probably not kicking out much more than this modern day world champion. Luis’s record breaking achievement of 813 foot pounds has given us a handle on what ancient slingers could have achieved with a handsling. I would suggest that any glans projection that tops an 800 foot pounds threshold with a 100-300 gram (or heavier) glans, is likely the work of a catapult rather than a human slinger. In contrast, Firefly is still nosing the bottom of the tent at 1,146 foot pounds. 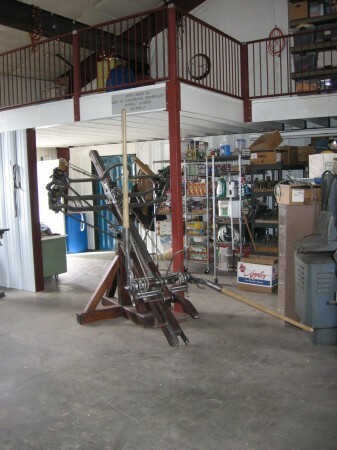 She also has a provisional 1400 foot pounds and 320 fps with a 400 gram glans from a previous experiment. Who knows what breakthrough we’ll discover with more development? For the time being, we will explore what a series of progressiverly heavier glandes can do; at least untill some break-over point is reached and the good stats start to dwindle. After that it will be up to the Mk. IX limbs to “up the ante”. Again, this comparison is not meant to discount the many obvious advantages of a handsling, but in a game of absolutes it is clear that ballista discharged glandes would have a utility at least equal to the expense of the special slingstring it took to fire them. If nothing else they might be used to convince the enemy they were up against some truly superhuman handslingers. The important thing here is: this is how my funk ended. With a 290 foot per second, 400 gram, ovoid chunk of lead. Also: here is a pic of the two oak speaders that were added to keep the strings an inch and a half apart. They are working better than expected. No signs of shifting whatever. Using our much larger, 400 gram, lead glans, we see that the pocket in the pouch does not exactly enclose our projectile on all sides. The danger in shooting too large a glans in too small a pouch is that it might slip out if the pouch takes an upward turn in its trundle down the deck. As much as I am dedicated to our obsessively inclined research project, I have no desire to get bonked in the noggin by an unruly lump of lead. I will test some mid-sized glandes in the 200 gram range tomorrow. They should be the right size for this pouch. Helmets mandatory. Okay, it is now “tomorrow”. I tried some shots with that ultra lightweight 56 gram slug and this time we did have the chrono hooked up. Average speed was a mind numblingly slow 242 feet per second. Energy, a pipsqueak 110 foot pounds. With this miniscule projectile we have effectively turned Firefly into glorified rabbit killer. At least we have demonstrated the unsuitability of too light a pill in a machine of Firefly’s size. I next tried three shots with 133 gram projectile and the velocity actually increased to an average of 354 fps. Enegy was 571 foot pounds. This energy reading is a far cry from the 1300+ foot pounds we generated with the 400 gram glans a couple of years back. Still, we are just working the parameters here to see what’s what. Yet another, slightly larger pouch will be needed to explore the 200-300 gram projectile range. …… Happy stitching ballista brain. Your thumbs could use the company. One of the important things to keep in mind with glans shooting is that the weapon is fully loaded with a lethal projectile through out the entire cocking sequence. 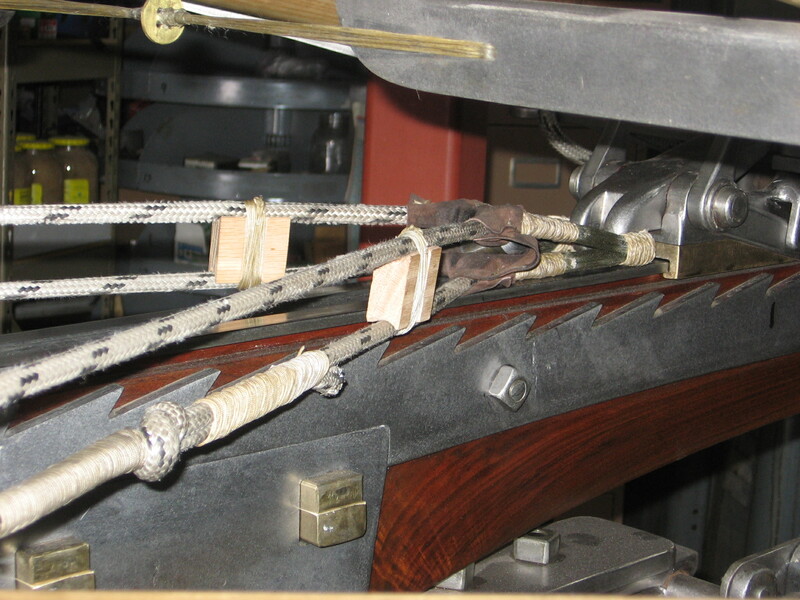 In bolt shooting it is possible to load the projectile just seconds before you shoot, with a glans it would be imprudent to do the “careful-seating-into-the-pouch-procedure”, on a cocked machine. In the photo below, Firefly is packing a projectile in her pouch as she is being cocked. This is not a problem because we have rigourously vetted our catch, trigger and winch sytems. In addition, any ballistic misadventure would be contained within an acceptable zone of destruction. 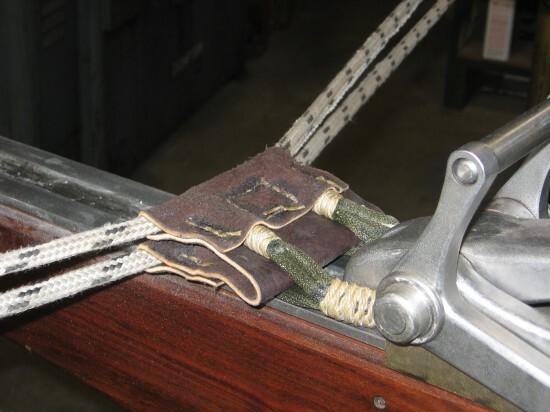 That first string was hastily cobbled together and had an open and laid back look about it. The nocks were much wider on the old set of MK. VI limbs that we using back then. This had the effect of widening the distance between the top and bottom strings, which in turn forms a more open pocket. I suspect this open pocket feature is important to prevent the glans from pitching downwards as it comes out of the machine. I just got through making shot #2 in this current trial, and like shot #1, it pitched down coming out of the machine; ignominiously grovelling in the dirt, before bouncing off into oblivion somewhere behind the vegetable garden. The pouch appears to be too big to me. That, and the double strings may need to be separated by spreaders of some kind. Reprising a previous success can get complicated. It seems ironic that we are engaged in a development project that is premised by prior success. I suspect that once we have blown through all the conceivable approaches that don’t work, we’ll arrive at where we started. Inverse deduction at its finest. Man does not live by glandes alone. 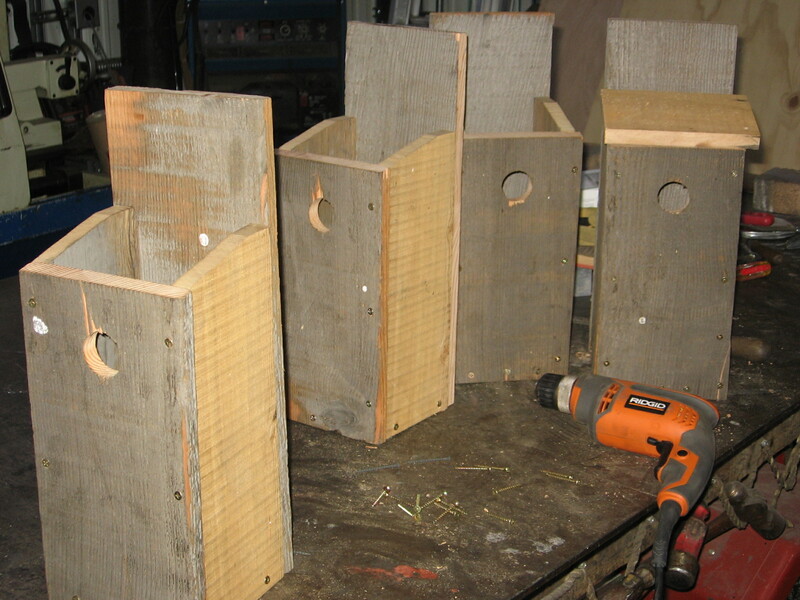 There is also Bird Boxes. Lots and lots of Bird Boxes. 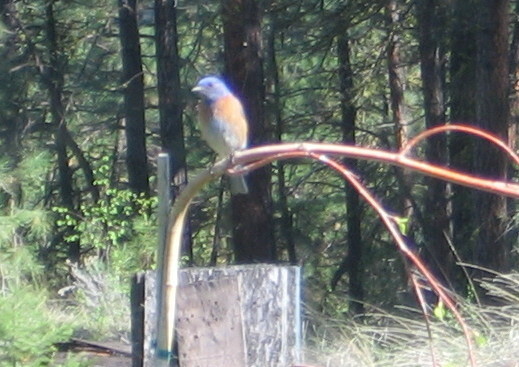 The annual migration of Western and Mountain Blue Birds has started to grace our wilderness lair. Catapultery must take a backseat, to favor these fine feathered friends with digs for the summer. Phase 2 glans trials. Continually updated as new shots are made. Draw length 31″. Draw weight NA. Velocity NA. Glans weight 400 grams. The slingstring was thrown off the limbs. It needs the webbing restraints, just like a regular bowstring. The glans pitched downwards and would have hit the chrono on the bayonet mount if I had not thought to leave it off. I suspected something like that might happen. Bonus point to me. Draw length 31″. Other data NA. 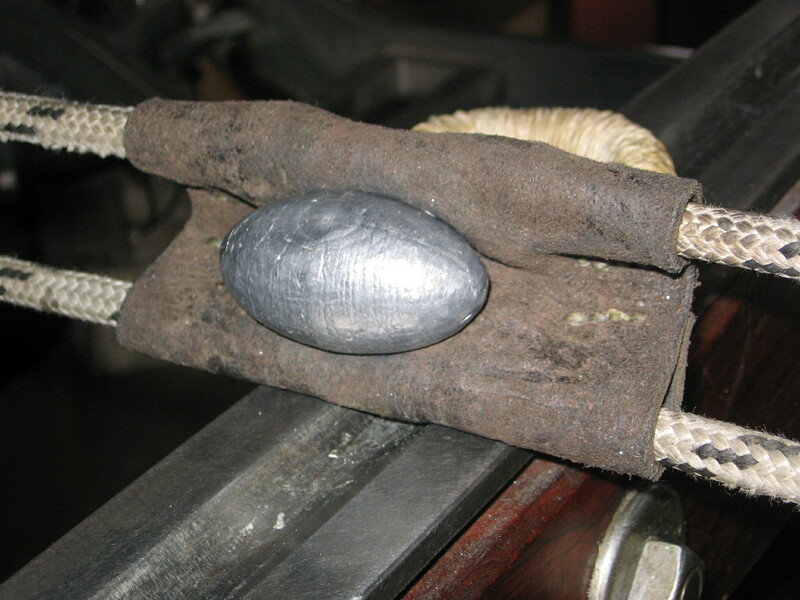 Rather than use one of our lead glans, the projectile was just an 1 1/2″ length of 1″ round steel bar. It too pitched down, and hit 20′ in front of the machine. However, our webbing restraints worked to keep the slingstring attached to the limbs. Draw length 31″. Other data NA. I replaced the leather pouch with one that is much smaller. Projectile was a piece of 3/4″ diameter, 1″ long steel rod, weight 56 grams. This steel cylinder sat snug in the pouch, with the top and bottom string providing a firm grip on the projectile. The shot did not not pitch down coming out of the machine, and held a level course out to the 50 yard backstop. Despite this advance, the weight of the projectile was clearly too light for Firefly’s massive limbs and draw weight. She is essentially working at dry-fire type speeds with this light a payload, (duh!). Velocity did not seem remarkable, however. Something triple the weight would probably be going just as fast. If down-pitching has been eliminated, the chrono can be hooked up again and we can assign velocity numbers to these shots. Then the games can really begin. It is the envelope we seek. Draw length 31″. Projectile: 56 gram steel slug. Velocity: 242 fps. Energy: 110 fpe. Amazingly bad performance. Might as well be firing frozen peas out of Firefly. No down-pitching though. Draw length 31″. Projectile: 133 gram steel slug. Velocity: 354 fps. Energy: 571 fpe. Although this is still a pretty weak performance, it does indicate an interesting increase in velocity. The only parameter that changed was the more than doubling of the projectile weight. Not at all what one would expect. Clearly there are subtleties at work in how the energy is absorbed from the limbs and slingstring. Flight of the slug was level and on target. Draw length 33″. Projectile: 155 gram steel slug. Velocity on #10: 247 fps. #11: 210 fps. 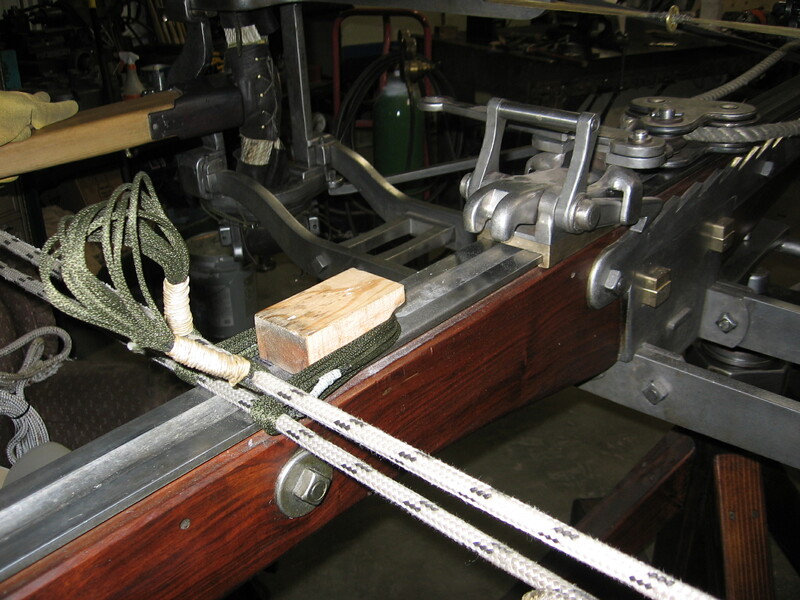 For #11, added a pair of spreaders to keep the top and bottom strings seperated by 1 1/2″. 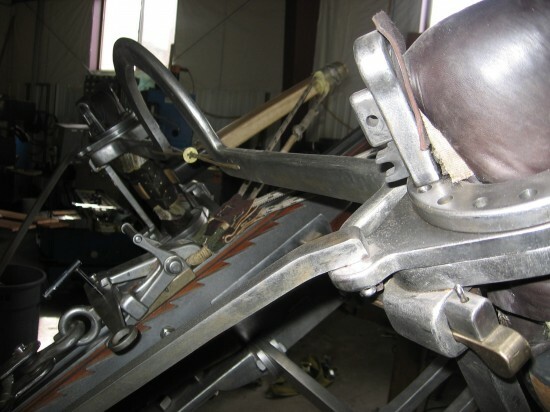 Maybe the extra weight of the spreaders caused the lower velocity. This is all appalingly slow. Spirits low. The machine has a higher tone to it when she fires. Sounds wierd, like she’s not pulling a load. Draw lengtth 33″. Projectile: 270 gram steel slug. Velocity: 284 fps. Energy: 746 fpe. Lower tone on firing. Draw length 33″. Projectile: 398 gram lead glans. Velocity 290 fps. Energy 1,146 foot pounds. Well zinger do-dandy! That’s more like it. All I did was switch to a much heavier projectile and the velocity went up. How can this be, inquiring kinds want to know? And yet, those are the facts. It flies in face of any physics I know. Clearly there are dynamics at work here I can’t explain. Also the tone of the machine was lower on firing. More like shooting a bolt. I’m thrilled that Firefly has her game back to those older levels from 2 years ago. Bemused as to how. More than just a mouthful. The leather pocket seen in the photo is currently empty. The double strings are closer together than our previous version from a couple of years ago. 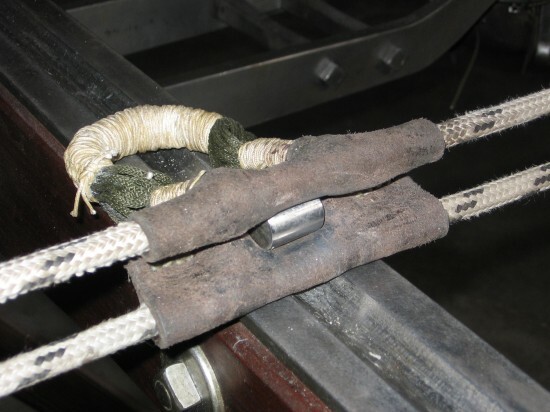 This should help to relieve some of the downpressure on the deck, lowering friction and increasing velocity. At least that is the theory. We’ll see…..
Dr. Rihll was kind enough to send on this photo of a glans tree. Unchanged, and exactly as it appeared straight from the mold with the runners, sprues and flash still intact, this lead artifact is from Peiraieus and is on display in the National Archaeological museum in Athens (aq. no.s 9299 and 9300). This particular artifact appears oddly familiar to me as my day job for the last 28 years has been as a mold maker for the rubber industry. Different animals to be sure, but the principles of layout and material flow are exactly the same. 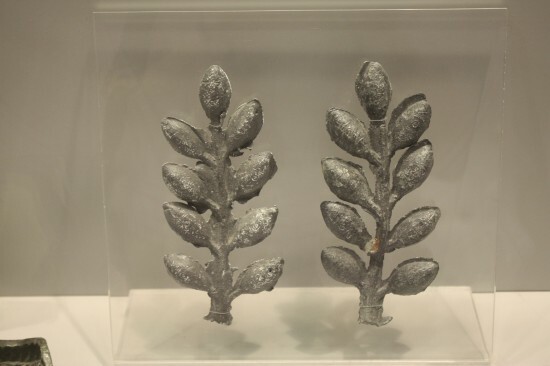 The glans mold I will be making is not designed for high capacity production like the ancient version that made these “trees”. For testing purposes our mold cavities will be designed to produce 50, 100, 200, 300, and 400 gram projectiles. In this next photo we can see a simple winding block that is stupid-glued to the deck. The intent is to make two stout loops, of equal length, with the 3/16″ green dacron line. One of the loops is for the top string in our double-string glans shooter, the other is for the bottom string. 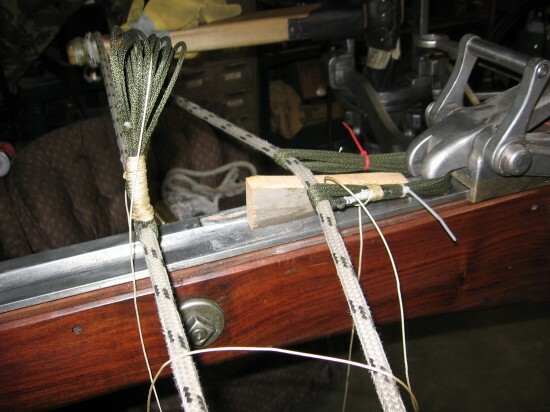 Below: Winding the thread whippings on the bottom loop, requires a wedge to lift the string and loop away from the deck. I fumbled around for 1/2 an hour before wising up and lifting the loop clear of the deck. Threading an eye is so much easier if you have nice big eyes. I suspect that our finished job is going to look very much like a “sling”.